Bio: Gilbert Garza is pursuing a Doctor of Musical Arts degree in saxophone performance at The University of Iowa, under the tutelage of Dr. Kenneth Tse. He currently performs with The University of Iowa Symphony Band and the University of Iowa Saxophone Ensemble. Garza holds a Bachelor of Music Studies degree with EC-12 Texas All-Level Certification from Texas State University and a Master of Music degree in Saxophone Performance from The University of Texas at Austin. He has earned several awards including Downbeat Award for Classical Group (Phoenix Saxophone Quartet), TMEA undergraduate scholarships, and was named a semi-finalist for the 2016 NASA solo and quartet competition. 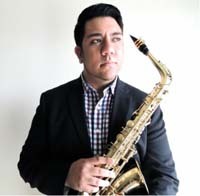 Garza has attended several prestigious summer programs including the 2012 Eastman Saxophone Institute, the 2013 American Saxophone Academy and L’Université Européenne de Saxophone. Casey Dierlam Piano undefined . . .